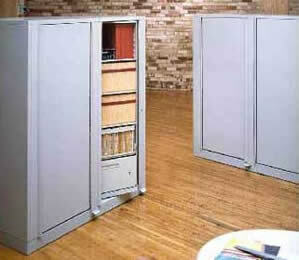 Rotating File Storage - Phone Chris Rodgers at 800-326-4403 for more information or buy online! Use the links down the left side of this page to find the Rotating File Storage for you. All units are avaiable for online purchase, but you always phone for Chris Rodgers at 800-326-4403 for any kind of help. Our highly trained designers will take the measurements of your space, and assure you get the most possible storage inches with your new Rotating File Storage system. Customized from Letter size to legal size, and 41" high to 92", We can design the exact system to fit your needs. Before you commit to expensive lease space, give us a call. Many of our Rotating File Storage systems and mobile shelving systems will pay for themselves, just in lease savings alone! With decades of hands on design, installation, and manufacturing experience, no other shelving company has the expertise to match that of NationWide Shelving. We have installed thousands of Rotating File Storage systems all over the nation. We understand the storage challenges you face, and have designers ready to create innovative solutions. Our Rotating File Storage systems are manufactured by Aurora, The leader in steel storage products and inventor of the Times-2 Speed File or Rotating File Storage. For Aurora and Nationwide Shelving, product quality is a must. Together we provide the best Rotating File Storage systems on the market, period! Since Nationwide Shelving is the top shelving provider in the nation, we are able to keep our prices low, virtually beating any price for our products on the market today. Rotary files save space and are the most efficient in storing files. Rotary files achieve maximum productivity with minimum wasted effort or expense. It takes numerous lateral files to equal the storage capacity of just one Times Two Rotary File. You can store more on the same floor space. Rotary files look more professional and are more durable than lateral files. Heavy duty steel insures your rotary files will be around for a very long time.